Last August, I found myself in a maddening position. I had the opportunity to lead a session on LEGO® SERIOUS PLAY® at a conference… but I had no LEGO®. The conference was the Applied Improvisation Network‘s (AIN) annual world conference, held in Paris this year, which my husband and I had used as an excuse to build a two-and-a-half-week vacation around. We travel light — carryon only — and when we were packing for the trip, I had gone back and forth about whether to bring a bag full of LEGO® duck kits. 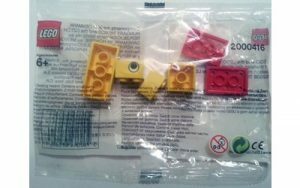 These are small baggies filled with six yellow and red LEGO bricks that are most often used to build ducks (hence the name). 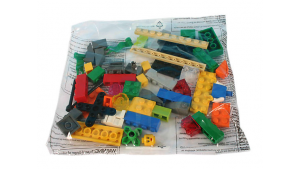 But I wasn’t sure I’d actually get a chance to use the LEGO, and since we were traveling carryon-only, a gallon bag of plastic bricks that might spend the entire trip in my suitcase felt like an extravagance I couldn’t justify, so I’d left them out. As it happens, AIN devotes two whole afternoons to what is called “open space,” where participants can propose a session topic. Anyone who wants to present writes their session title on a sheet of paper and lines up for a 40-second spot at the microphone to pitch their topic in front of the assembled crowd. The papers are then posted on the back wall of the auditorium, where they are assigned locations, and for the rest of the day, conference participants can attend any session(s) they choose. If only I’d brought my LEGO ducks kits with me I could offer a workshop on LEGO® SERIOUS PLAY®! Thankfully, on the very first day of the conference, I met Andrea Montuschi, a fellow LSP practitioner from Italy. Andrea has also come to Paris sans LEGO, but unlike me, he didn’t let that stop him from deciding to present a session on LEGO® SERIOUS PLAY®… with an interesting twist. 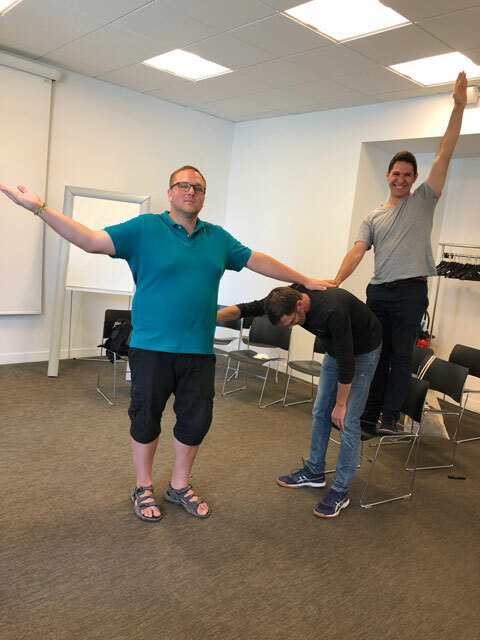 Being a true improviser, not to mention highly creative, Andrea simply worked with what he had on hand; he proposed we run a session he called LEGO®(less) SERIOUS PLAY®, using human bodies instead of LEGO bricks. Our open space session drew 20 attendees, which turned out to be an ideal number for our purposes. 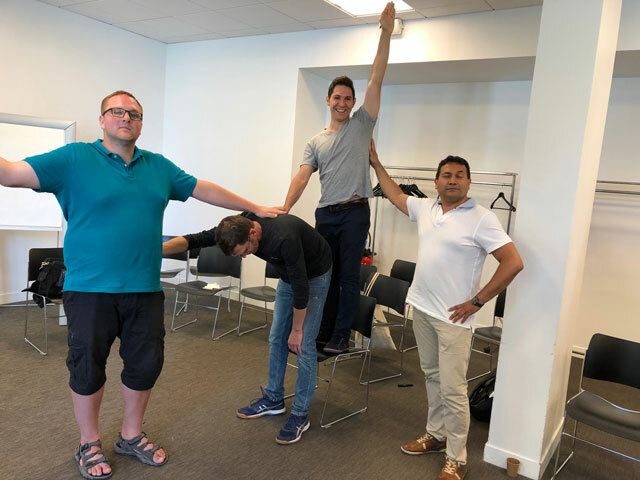 We solicited 5 volunteers to be “participants” in a LSP workshop, assigning the remaining fifteen attendees the role of “LEGO bricks,” so each “participant” had three human “LEGO bricks” to build with. Then we proceeded to lead a fairly standard LSP workshop, first explaining a bit about the history and etiquette of LSP, and then moving on to the builds. In this case, of course, these instructions were moot! As with a typical workshop, however, we gave our participants a minute or two to “assemble” their three “bricks” into a tower — whatever that meant to them. Just as with a workshop where participants build with plastic LEGO bricks, no two towers were alike, and we had a rich debriefing moment about what “tower” meant to the different builders, and what they were thinking about as they built: height? stability? design? It was at this moment that we also quickly discovered the challenges of using human “bricks”: plastic models can sit on a table indefinitely, waiting their turn to be shared; human models get tired, and can’t hold uncomfortable positions forever! We had our “bricks” release out of the model positions until it was their builder’s turn to share their model… but then sometimes the “bricks” and the builder forgot their original position. Eventually Andrea and I learned to prompt everyone to “Remember your position — seal it in your brain!” before letting them relax until it was their turn. All excellent questions, which we didn’t come to definitive conclusions about, but which led to some rich discussion. Some LEGO minifigures® have two-sided heads, which could be used by a builder to indicate a changing expression. And minifigures have movable arms, though not as multi-jointed as human arms. But were we trying to mimic LEGO bricks in this activity? We were using the activity to teach a bit about the LSP methodology, as we knew it, in a creative, improvisational way. As we proceeded with our open space, it felt to me that we were creating a hybrid activity, one that came to exist on its own merits. It was informed by LSP, and it was a useful tool for teaching about LSP, but it wasn’t LSP; it was its own animal, as it were. However, it turned out that our attendees had lots of questions, and were more interested in Q&A than continuing with our original agenda. So like good improvisers, we went with the flow. Instead of five or six builds over 90 minutes, we ended up doing only about three builds in total, swapping “participants” mid-way through, so more of our attendees could get a chance to see what that role was like. The rest of the time we answered attendee questions, which ranged the gamut from LSP process to business-related questions. 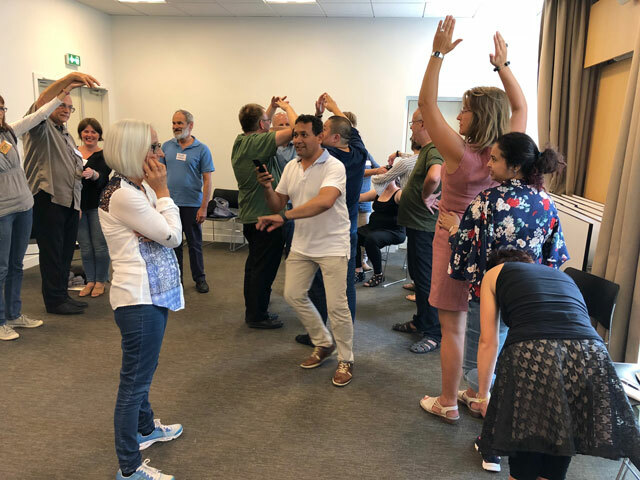 Since this was a conference on applied improvisation, it should come as no surprise that attendees were especially interested to hear how we’ve integrated improv and LSP. This is an area that I’m personally eager to explore more. I bring improv into my LSP workshops as breaks in between LSP activities, and in small, spontaneous ways as they occur to me. So far, LEGO®(less) SERIOUS PLAY® is my most extensive example of weaving the two modalities together, even though no LEGO bricks were actually used! I’m grateful to Andrea for generously bringing me in on his brainchild of an idea. Working together with him was great fun, and from the feedback I heard from attendees (and friends of attendees), it made for a great experience for all involved. Who knew you could have so much fun playing LEGO without any LEGO bricks?